Extremely skin-healing and rejuvenating for the liver as well as the kidney. Over 70% carotol! We love to use Carrot Seed essential oil for its skin nourishing benefits. It is fabulous in any blends that are made for the face and skin. We have experienced the healing properties which Carrot Seed essential oil imparts. Many skin conditions have been assisted with the use of Carrot Seed such as eczema, psoriasis & other skin irritations. Basically we have seen dramatic results using Carrot Seed essential oil for the skin, that we almost always will recommend its use. Just as Carrot Seed clears and assists the skin, which is our largest organ, Carrot Seed clears and assists on the energetic level. It can help clear away mental stress and works on the 2nd 3rd , 4th, and 6th chakras. Carrot Seed helps move energetic blocks, allowing for a free flow of energy and strengthening inner vision. When our third eye or persepective is clear, there is a clarity that shines forth through the eyes and skin as well. When the emotional body is soothed, the integumentary system, or skin is soothed. This is such a good example of how we are connected, mind, body and spirit. Our inner lives are reflected through the outer layers of our skin. Carrot Seed is an excellent purifier. This is mainly due to its detoxifying effect on the liver. It is diuretic and hepatic, operating as a kidney and liver cleanser. Carrot Seed is an aid for healthy skin. It can be used to improve the complexion and is known as one of the best skin revitalizing essential oils. It works well to deal with wrinkles and skin that has been affected by the environment such as harsh weather conditions. It is recommended as a regenerator for dull, lifeless & tired skin. It adds tone and elasticity to the skin thereby giving a more youthful appearance. The high carotol content in Carrot Seed is what gives this essential oil its wonderful skin healing properties. 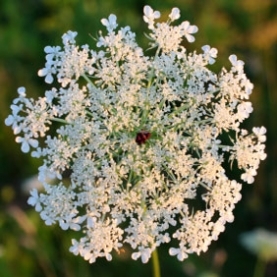 Daucus carota is a biennial plant that grows a rosette of leaves in the spring and summer. The stems grow between 1-4ft. There is an umble of small white flowers in a lacy looking flat-topped cluster; 3-4 in. wide with a deep purple floret in the center. The distinctive umbels and floral nectaries attract pollinating insects. Many medicinal claims for wild carrot include supporting elimination, stimulating the flow of urine, and the removal of wastes by the kidneys. The seeds help clear out the kidneys, and are useful in cases of gout. As other plants in the carrot family, the seeds are carminative. The name "carrot" is Celtic, meaning "red of color", and Daucus from the Greek "dais" to burn, signifying its pungent and stimulating qualities. An Old English superstition suggests that the small purple flower in the center of the Wild Carrot was a cure for epilepsy. Carrot Seed symbolizes new growth, of new possibilities, of spring and of renewal. It helps us to feel positive energy when we sometimes get overwhelmed and stuck in the mire of everyday life. It helps us shed the old layer and bring in the new. It is associated with the second chakra and tapping into the "seeds of change". Blend in 2 oz of unscented lotion for a delicious skin creme. According to Tisserand & Young, Carrot Seed Essential Oil may interfere with gestation. Contraindicated with Pregnancy & Breastfeeding. Some sources claim that carrot seed essential oil may be slightly photo-toxic when distilled from wild carrots. Other sources refute this claim. Battaglia, Salvatore. The Complete Guide to Aromatherapy. 2nd ed. Brisbane QLD, Australia: The International Center of Holistic Aromatherapy; 2003. Damian, Peter and Kate. Aromatherapy: Scent and Psyche. Rochester, Vermont: Healing Arts Press; 1995. Davis, Patricia. Aromatherapy An A-Z. London, UK: Vermillion; 2005. Sellar, Wanda. The Directory of Essential Oils. 7th ed. Cambridge, England: The Bath Press; 2001.